Velvet is one of the key trends this season and it’s a fabric I happen to love. It’s tactile, rich and warm and the perfect choice for the party season. However, it’s easy to style and more versatile than you might think. 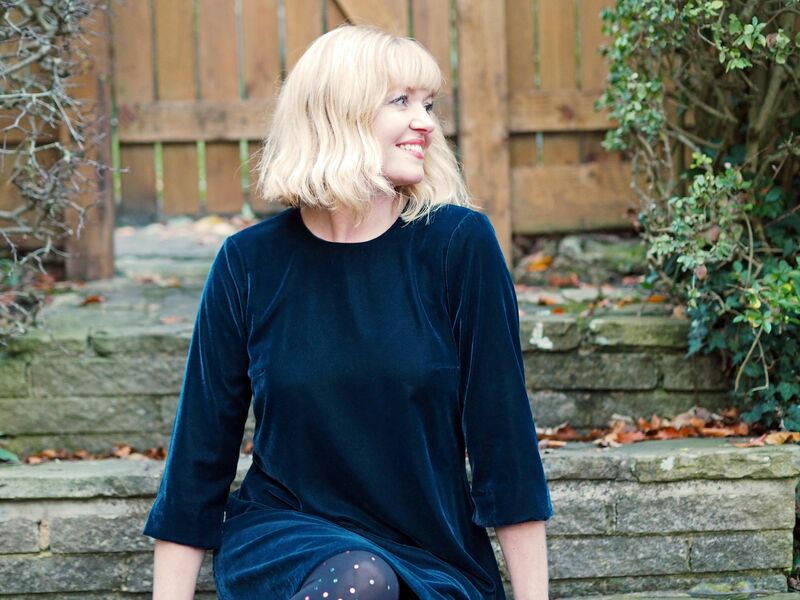 This teal velvet swing dress is from Hobbs. You might remember that I styled it casually with purple knee boots in early autumn. It shows that every fabric, even those more usually associated with evening wear, can easily be worn during the day. 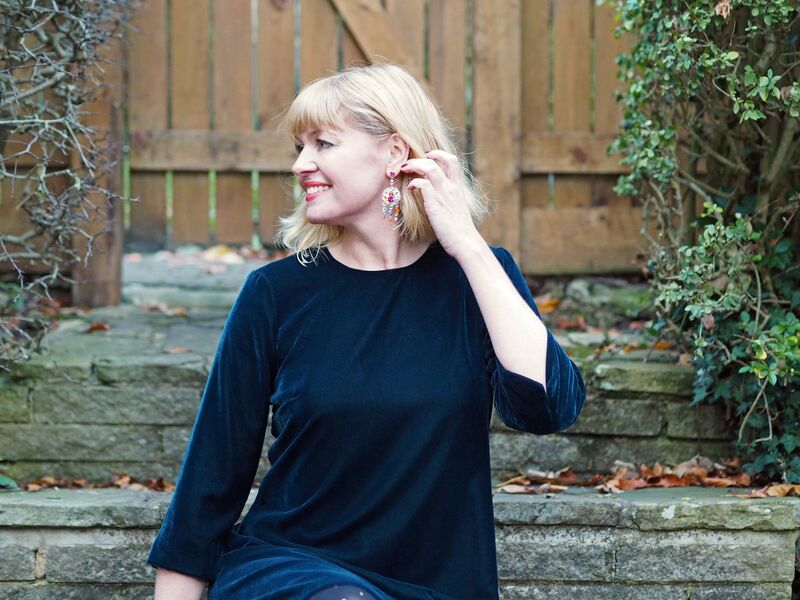 This was an evening occasion though, dinner at Stirk House with Sally which you can read about in my previous post, so I added sparkly tights and statement earrings. The teal is a beautiful colour, and although it’s rich enough to hold its own, I wanted to add a little rainbow sparkle. It is party season after all. The multi-coloured glitter clutch is from Boden and is three or four years old and I never tire of using it. ( The super peridot Swarovski cocktail ring is from Lisa, (The Sequinist’s) shop. 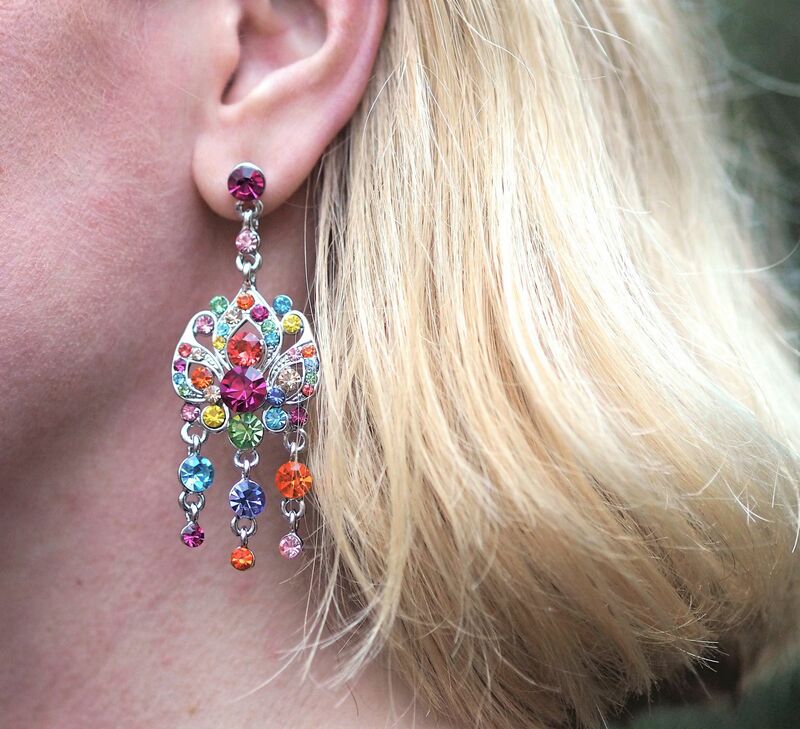 The rainbow Swarovski crystal earrings are the Abracadabra from Eternal Collection. You might remember that I wore them and the matching rainbow necklace with a little green dress recently. I knew when I chose them that the gorgeous myriad of colours makes them the perfect accompaniment to so many outfits. 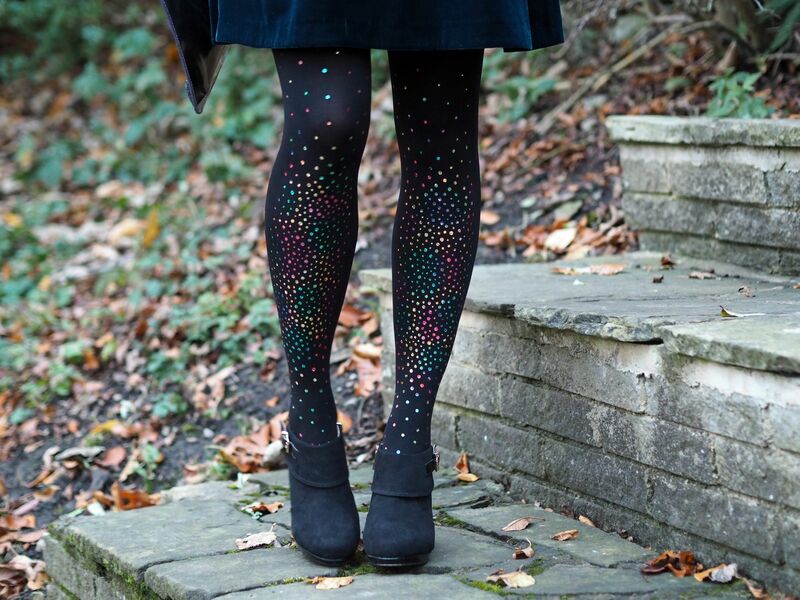 How amazing are these fabulous Aurora tights by Pierre Mantoux? They’re stunning and elevate this velvet swing dress into something very eye-catching. I don’t have a single pair of plain black heels, they’re either sparkly or embellieshed in some other way. As much as I wanted to add sparkle and shine to the outfit, I didn’t want overkill. I do however have some plain boots. These black ankle boots with gold accents are simple and elegant. I like them so much that I also have them in grey which I wore with coated leggings. They also come in a vibrant red. This shape of boot works with a lot of styles so is a good wardrobe addition and is a flattering cut because it shows off the slimmest part of the ankle. And here it all is in action! Thank you to Poppy for taking the photographs in a mad rush after school before it went dark and to Sally for taking the one above. This isn’t a sponsored post but my dress was a gift from Hobbs and the tights were a gift from UK Tights. Thank you for supporting those brands that support What Lizzy Loves. Next Post Black Friday Deals: My Favourite Winter Clothes, Shoes and Accessories. Wow! Those tights are amazing! Never seen more beautiful tights then these! And the heel of the shoe is very pretty. Fabulous look. A beautiful dress, some wonderful socks, a great outfit! I love the fabric and the simple and beautiful design of your dress. The originality of the color in your socks and the beautiful jewelry make the look something great. This outfit is absolutely gorgeous, Lizzy! I love swing dresses and adore velvet so this is a match made in heaven… as are those tights!! LOVE them. Are there sparkles on the back too? You look beautiful! hey I love this Velvet dress, you look great in it.